Gourmet meals, family cookouts, and backyard memories start here. Tired of running back and forth from your tiny grill to inside your home to grab something out of your kitchen? 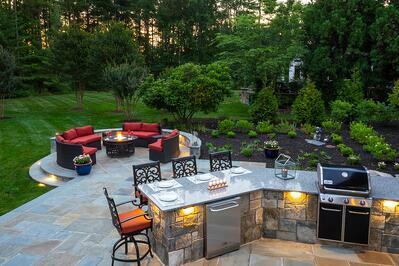 Now you can be at the center of the party, right alongside your guests with a custom-built outdoor kitchen. It's no surprise that outdoor kitchens have become all the rage in the past 15 years. Whether it's grilling, smoking, washing, prepping, storing cold beverages, or even cooking pizzas, we know how to help you keep the party going as long as you'd like. The days of over-cooking boring burgers are over. 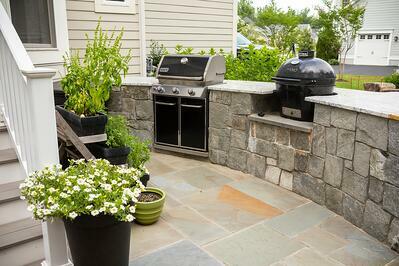 An outdoor kitchen can be just the inspiration you've been looking for. We can help you by designing and creating a culinary space that you and your guests absolutely love spending time in. Beyond the outdoor kitchen itself, Rock Water Farm can create the ultimate backyard setting so you can get the most use out of your outdoor living area. If you’re interested in learning more about adding an outdoor kitchen at your Ashburn, Aldie, Leesburg, Haymarket or Great Falls, VA home, we’d love to talk. Check out some of the images of outdoor kitchens we designed and built. When you’re ready, don’t hesitate to contact us for a consultation with one of our landscape design team.